it is actually much simpler than you think, but there are a few tips and tricks in order to do it correctly. I should note that this applies to both culinary and medicinal herb drying. You may have read somewhere that you can use the microwave to dry herbs, but it really isn't a good idea as this reduces the potency of some of the oils in the herbs and it may even cook them a bit! Generally, it is best to harvest any herbs before flowering unless like acerola, it is the fruit you are after. With acerola it is best to harvest the fruit when green to get the highest concentration of vitamin C.
With non-perennial herbs, you can harvest all season, but it is best to get everything before the plant begins to decline. In colder climates you may be able to bring the plant indoors in a pot for the winter. I do, and I keep them in a back room that is cooler but gets plenty of sun. When in a colder room, you do not have to water as much, perhaps once every week or two. You should also cut the herbs mid-morning when the dew has dryed. 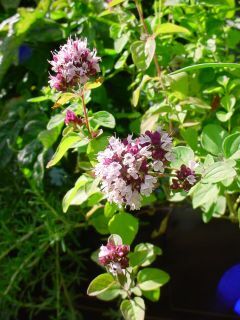 Cut only healthy branches of the herbs, shake gently to remove any insects. Remove the bottom inch or so of the leaves before drying. Rinse with cool water and pat dry with paper towels. 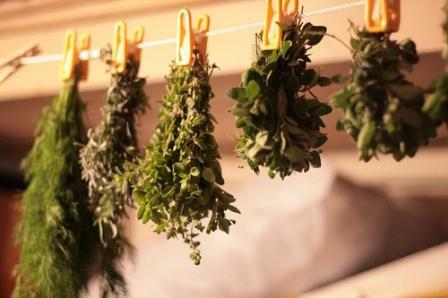 Do not hang wet as the herbs may get moldy! Bundle the herbs at the bottom with a rubber band and place upside down in a brown paper bag. Gather the bag around the end of the bundle and tie it. Hang the bag upside down in a cool room to dry. Check the herbs over the next few weeks since as they dry the rubber band may become loose. Once fully dried, remove leaves from stems and store the herbs in air tight containers. Make sure you label them! (Yes, I have forgotten to do this.) Most herbs are good for about a year. Once they lose their color they have lost potency and should be discarded. Visit the herb dictionary online.